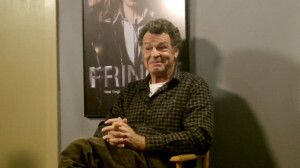 The Fringe team has gone and ambered themselves into the year 2036 for the final season of Fringe, and while on a set tour last week, KSiteTV and other outlets were able to speak with the show’s talented cast, including the incredibly kind and gracious John Noble, who plays Walter Bishop, one of the series’ most beloved characters. In the Season 5 premiere, the team was reunited with Olivia, which could get a bit on the awkward side as she and Peter grew apart after the disappearance of Etta in the past. Now that Etta is back — albeit as an adult — could the team end up working together? “The team re-bonds, it has to. It’s forced to bond,” Noble says. “These people have now become the rebels. They, as a team, and individually, are public enemy number one. They will become tense and they will become frustrated with each other, but then they have to come back and bond together. 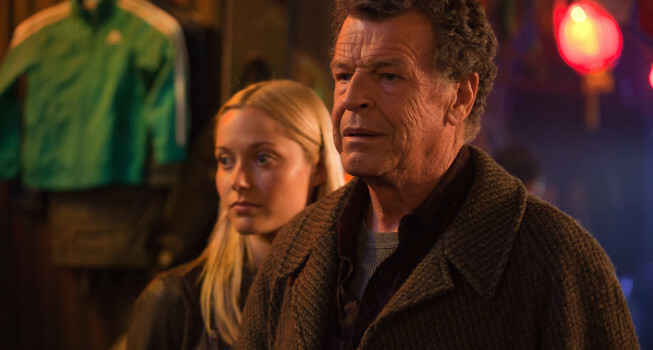 It’s very realistic, and it’s something that I’ve always wanted to happen on Fringe — where we have a common enemy, where we’re forced, in a sense, to be the bad guys in the world view,” he continues. “The level of affection between the principal characters is really deep, and I think we’ve seen that build up over the four seasons previously,” he says. “It’s really very fundamental stuff. It’s like a family. So even though we may snap at each other and carry on like that, it is like a family now. We would die for each other, literally. So that’s what holds us together. There will certainly be ‘grr’ moments of great frustration. My darling Astrid cops it a bit, sometimes,” he teases. As Season 5 goes on, we will see that Walter has dropped some clues around so that the solution to defeating the Observers can be found. “I think the fascinating thing about this season as it goes forward, is that Walter has set this up by planting a series of clues, and it’s like a treasure hunt in a way,” Noble says. “The genius that the writers have done this year, because we don’t want to do monsters of the week — we didn’t want to, we wanted something for the fans — we have to chase a clue a week, really. So that creates, in terms of story each week, we’re going after these bizarre clues in very strange places. Because Walter being Walter has hid them in weird, weird places. Very strange places. So he’s pushing forward with that. But they’re all driven. They have a plan that will defeat the Observers, but they’ve got to get all of these pieces together, and Walter is struggling with his lack of memory. And the fact that they are rebels lifts the ante a lot. It’s a really exciting journey,” he enthuses. The future isn’t all fun and games; there are some things that Walter does not like about being in 2036. “He hates the food. He still eats it. He thinks it’s a rotten future, because the food is really bad. That doesn’t make him very happy,” Noble says. 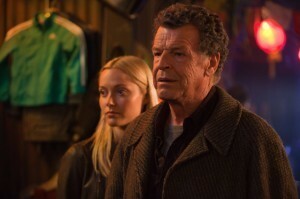 Ultimately, John Noble is happy that he has been able to see Walter Bishop’s story to the end, rather than to have the show conclude without a proper resolution. “If you’ve created characters and are allowed this long to live with them, then we should complete their stories. And Walter’s is a massive morality tale, really. What the writers have spoken to me about, and what I’m hoping, is to complete that arc. He basically broke, as he says himself, he broke the laws of God and nature to do what he did, which establishes what Fringe is and has been. Somehow or other, that has got to be corrected, and will be. I think that’s natural. I’m not saying punished, it’s not punished. I think it should be corrected, and will be,” he says. 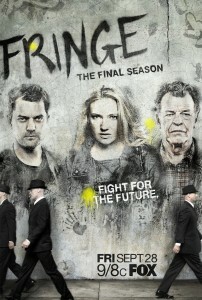 Fringe airs Friday nights at 9PM on FOX. You can read some of KSiteTV’s other Fringe coverage here. DISCLAIMER: Travel and hotel arrangements for our Fringe set visit were provided by Warner Bros. Television.